If you dropped your keys in the sewer and had two choices: go get your dad or your dad’s best friend next door, what would you do? Me? I got the friend. Facing the two houses, I went to the one where Mr. Frank lived. Mr. Frank amiably got a hanger to help me fish out my keys. Unfortunately, my Dad noticed us and came outside. As expected, he was irritated. But Mr. Frank was an expert at fixing all things – he got the keys out and calmed down my Dad. Did I mention I was in my 20s when this happened? If you knew him, he would do anything for you. Frank and my Dad moved me multiple times. He could and would fix anything. He brought a calm demeanor to awkward situations. He would loan you his truck. Feed your cat. I’ll never forget when he looked me right in the eye and said, “You can do anything you want.” I believed him because I always believed Frank. 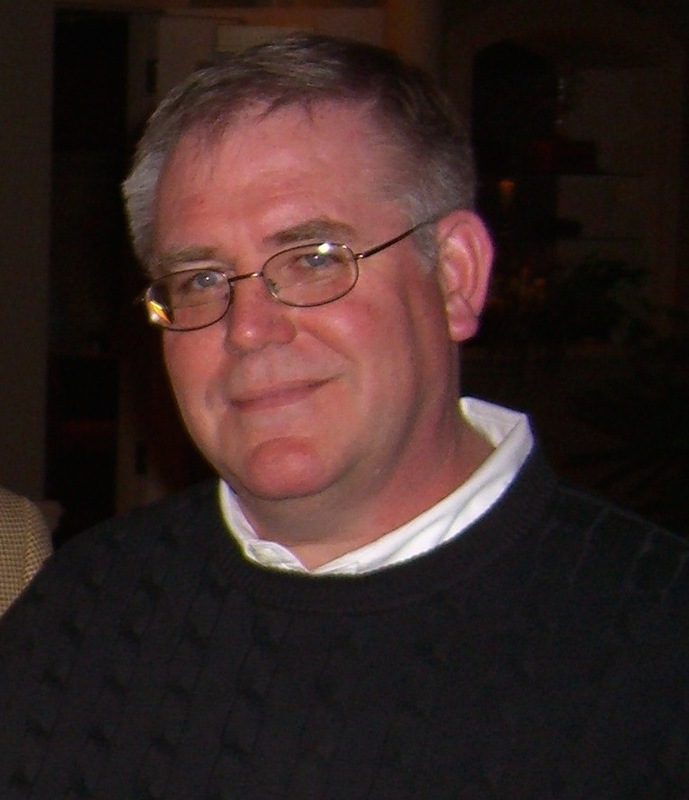 Mr. Frank died last June in his early 60s; it pains me to write it. That’s why, standing in the Vero Beach Book Center on vacation, the title Mr. Frank caught my eye. I flipped through it, thought it looked charming and bought it for myself. The story, written and illustrated by Irene Luxbacher is based on her father. It’s beautiful. Mr. Franks sews through the decades. Mr. Frank, an elderly tailor, gets a phone call asking for the most important order of his career. Luxbacher takes you through the decades of his work and the fashion trends he worked on. Max did love the costume and asked for the book three nights in a row, “I want to read the book where the guy makes all the clothes.” He was fascinated with Mr. Frank’s process, “Look, he had to find just the right thing and then draw lines before he would cut it,” Max said. 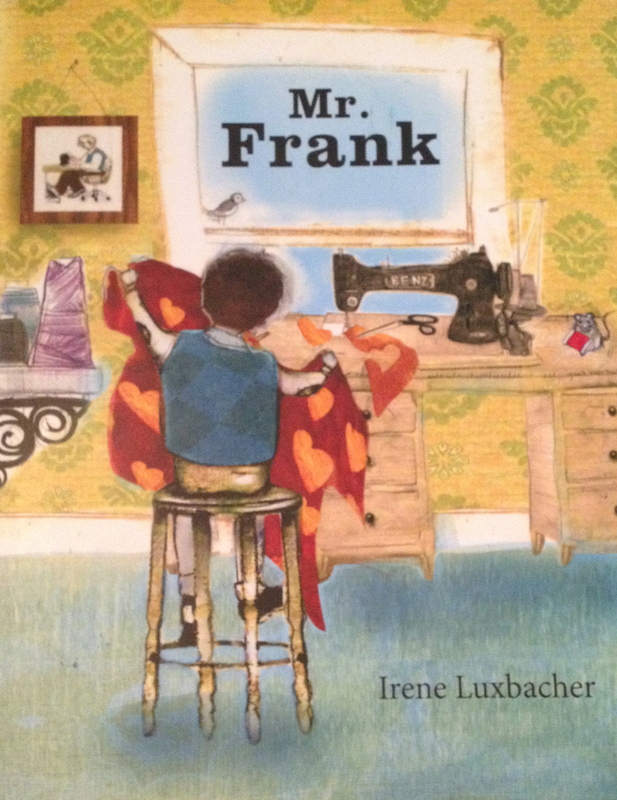 Snuggled into bed on vacation, the three of us savored the last page showing Mr. Frank and his grandson sewing together. My boys love the last page of Mr. Frank. Everyone should be so lucky to have a Mr. Frank. Throwing it way back. 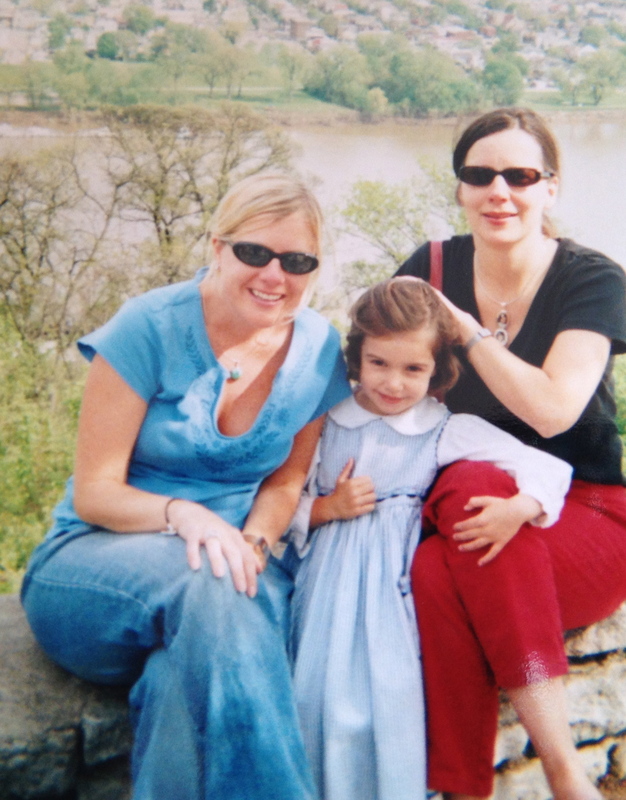 Me, Mary Mac, and Eloise around 2002. Have you ever been on vacation with someone else’s kids? It’s a lot easier when they aren’t yours. I used to be that single friend, enjoying the kids but not being responsible. I remember picking my friend Eloise’s daughter Francis out of her crib, thinking I was helping. “Once she’s up she won’t go back to sleep,” Eloise moaned. Who knew? I thought. I also recall her daughter Mary Mac asking me why I took so long in the bathroom. “Well, I’m not used to someone being in here with me,” I said. If I only knew that someday privacy would be a memory. On one of my trips with Eloise, I brought Mary Mac the book Fly High! The Story of Bessie Coleman. Mary Mac, soon to be 16, was five at the time. The book is by Cincinnati writers Mary Kay Kroeger and Louise Borden. (Kroeger is a former coworker of mine.) 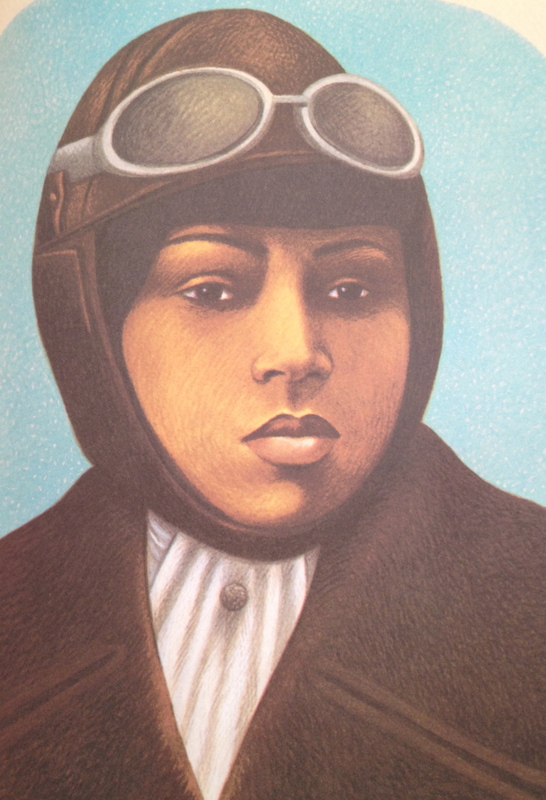 Teresa Flavin’s illustrations compliment the story about Bessie Coleman, the first African-American female pilot. Eloise recently shared with me that she still has the book and uses it in elementary school classrooms. Bessie walked four miles to and from school every day. What do you love about Fly High? I never heard of Bessie Coleman until you gave Mary Mac Fly High! back in 2003. Harriett Tubman, Josephine Baker, Rosa Parks – these were the women I often read about and heard about during Black History Month. And what an amazing woman she was! 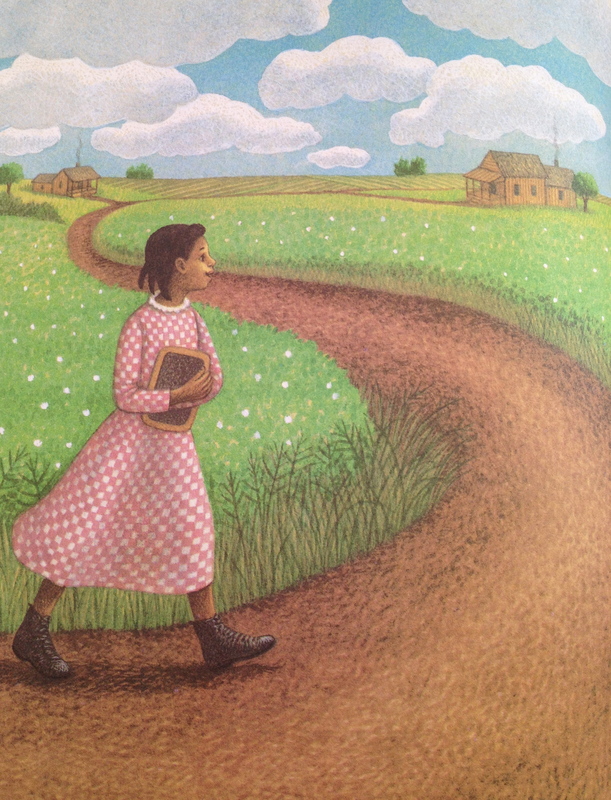 A true pioneer, a dreamer, a hard worker, an adventurer, and according to this authors it all began with her love of reading as a small child laboring in the cotton fields of Texas. What are the odds of a daughter of illiterate farm hands becoming the first African American female aviatrix in America? Do your kids like it? Is that why you’ve kept it all these years? I kept the book because I love it. In fact I keep a lot of children’s books. Some to bequeath to my children when they grow up and have children of their own. Some because they never get old like Munro Leaf’s Ferdinand the Bull or all of Kevin Henkes‘ mice books. I wish I was an elementary school media specialist. I love children’s literature board books, picture books, early readers, young adult, classics and new. I also store books in categories to pull and place in a basket by the fireplace each month. In February I fill the basket with books relating to Valentine’s Day and Black History Month. Mary Mac especially loves this book because it is inscribed to her by one of the authors, Mary Kay Kroeger. But all the children love it. Even my son loves the idea of being a barnstorming pilot. Tell me about the kids you’ve read this book to and the props you use? When I was invited to Guilford County School’s Community reader day and found out I was assigned to a third grade class, I immediately picked this one. I thought the book was both interesting, inspiring, and the pictures were good. I began by introducing myself, the book and then showed the children a picture of my children. I wanted them to know who I was – a mom – and why I chose the book. I wanted them to know that all of them and all of my children could “be somebody” just like Bessie Coleman. Eloise uses these props while reading Fly High! 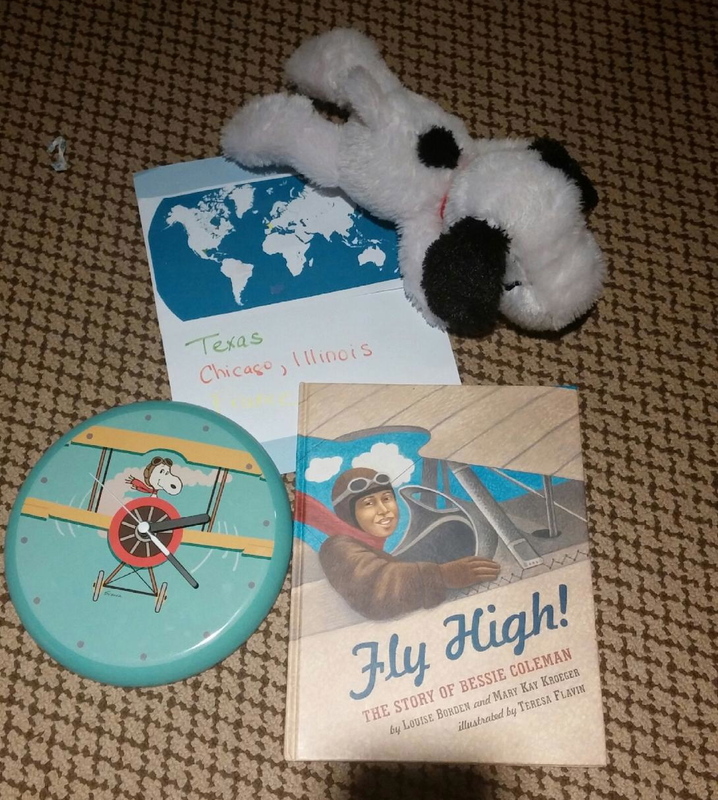 I brought Snoopy and the clock because I wasn’t sure if third graders in 2015 would know what pilot or biplanes looked like in the early 20th century. Thankfully Snoopy remains popular today and is even gaining a resurgence of popularity thanks to the expected release of The Peanuts Movie this year. I had to laugh when I asked the children if they knew who the stuffed animal was and one boy responded, “Snoop Dogg.” But I was really amazed at their interest in the picture of Snoopy in the wall clock. That was by far the most interactive, fun part of our open discussion time. When I asked what they noticed about the biplane compared to today’s planes I got all sorts of great answers, “Two wings” “Open top” “Like a Convertible” “Cool leather helmet and goggles” “Propeller driven” and my favorite, “In the Peanuts’ movies, Snoopy imagines his dog house is a biplane” … and that was the question I used to begin reading the book. After reading the book I shared the map I had printed out to show them just how far Bessie Coleman’s dream, hard work and desire took her. She traveled from the cotton fields of Texas to the big city of Chicago to the airfields of France. And I encouraged all of them to “Fly High” through the power of books, their imagination, hard work and their dreams. When I left I heard the teacher say to her classroom, “Doesn’t that book just make you want to try something new or do something crazy?” I hope the 20 minutes I spent with them planted seeds … just like Bessie’s mother did so long ago by giving her access to books as a child. Kroeger and Borden also collaborated on another historical book, Paperboy. This story is based on Kroeger’s father, a paperboy in Cincinnati’s Over-the-Rhine (OTR) in 1927. The story is during the time of the famous Jack Dempsey/Jim Dempsey fight. Ted Lewin’s images of OTR are excellent and Max and Calvin love recognizing parts of their city. Borden is a prolific, well-known writer. Check out her website to explore her work, favorite authors, school visits, and more. One of my favorites is The Journey that Saved Curious George illustrated by Allan Drummond (another recommended site.) This true story about George’s creators, the Reys, is for adults and kids. Did you know the Reys escaped the German army during World War II on a bike? It’s an incredible and beautiful book. Avoiding vegetables is a childhood art form. Growing up, I would spit vegetables into my napkin when my parents weren’t looking. (I also enjoyed making my brother laugh when he had milk in his mouth. He would spit it all over the table much to the outrage of our dad.) It was the 70s and on babysitter nights, we had TV dinners with the pea, square carrot and corn combo. This made me gag and reach for my napkin. My husband said he and his siblings would put unwanted greenery on a little ledge under the dining room table. These green beans are mean. Not eating your vegetables pays off in one of our favorite books. In How Martha Saved Her Parents from Green Beans, Martha refuses to eat her green beans every Tuesday night. “Green beans are bad. Very bad,” Martha thinks. The author is David LaRochelle and the book is illustrated by Mark Fearing. Martha’s refusal to eat green beans is rewarded. 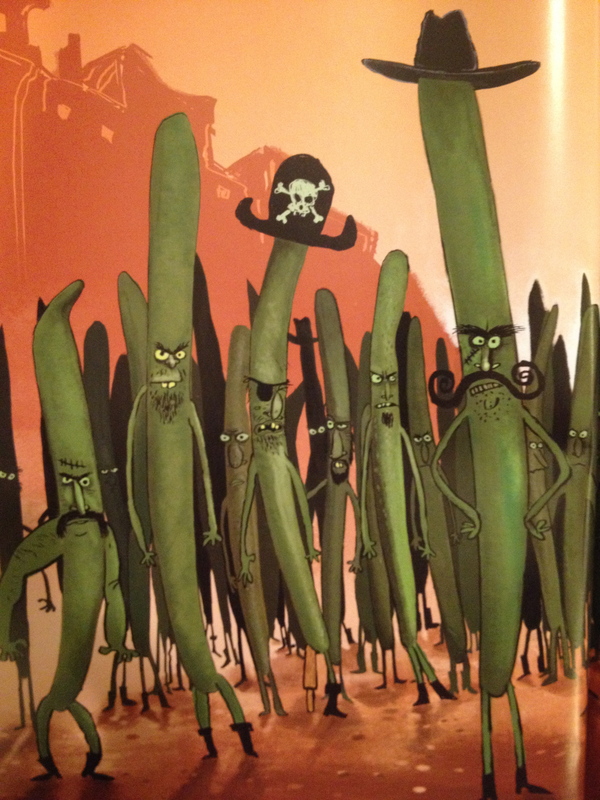 When mean green beans with beady eyes, long curly mustaches, hats, and pointy boots swagger into town terrorizing anyone who has ever eaten a green bean, they leave Martha alone. They make rude noises, hoop and holler, and take Martha’s parents captive. At first, Martha enjoys it. She doesn’t have to clean her room! She stays up late, eats cookies and sugary cereal for dinner, and watches bad TV. It’s a little like she’s in her 20s but she’s a little girl. But she misses her parents (what you won’t admit in your 20s) and decides to rescue them in the morning. Gulp. Martha eats all the beans, rescues her parents, and settles into a life of eating less threatening veggies. But does she? That nice leafy salad looks menacing. Little Pea written by Amy Krouse Rosenthal and illustrated by Jen Corace, is about the culinary habits of vegetables. Little Pea is a happy little guy, except at dinner. 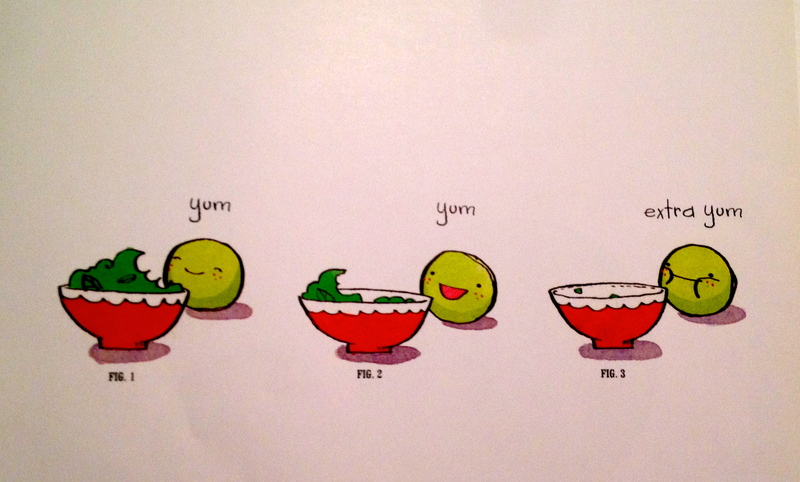 Did you know peas eat candy for dinner? And his parents make him eat it. For some reason, I like to read this story sounding like Tom Haverford, Aziz Ansari’s character on NBC’s Parks and Recreation. I know I’m weird but it works. My boys crack up at the image of little Pea eating his candy. “One. Yuck. Two. Blech. Three. Plck. Four. Pleh.” This is a line my family often repeats in daily life. After checking out How Martha Saved Her Parents From Green Beans about 20 times from the library, we bought it. You can find it at Cincinnati’s Blue Manatee or order it from Powell’s City of Books. Author LaRochelle is also a pumpkin carver! Check out his designs and other books on his website. Mark Fearing offers green bean coloring pages on his website. His blog features mean green beans and other cool stuff. 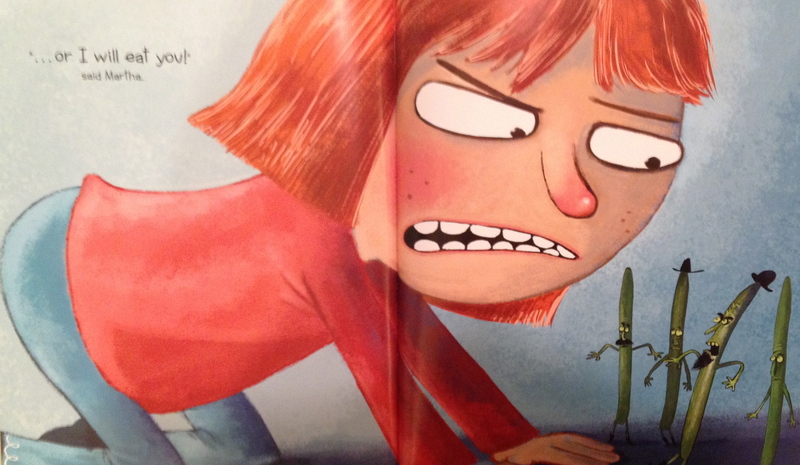 You can find Little Pea at Amy Krouse Rosenthal’s little books at Chronicle Books or Rosenthal’s website. She’s also the co-author of another wonderful book that we love, Exclamation Mark with Tom Lichtenheld. My husband and I discovered it at Carmichael’s in Louisville, Kentucky. Lichtenheld is also the author of the Max and Calvin approved Good Night, Good Night, Construction Site. Take a moment to peruse Rosenthal’s site. She has adult books, art projects, the works. 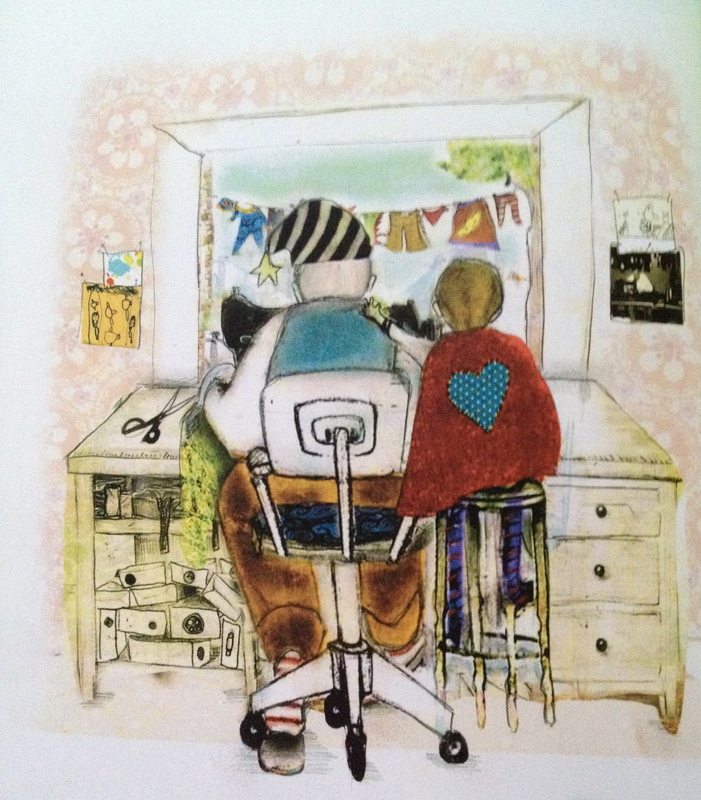 I also found the illustrations on Jen Corace’s site beautiful. Shout out to Melissa Currence for helping and inspiring me with this blog!